Putting the kids into daycare is crazy expensive, but staying at home with the kids means earning less money. Or does it? More and more moms are working from home and not only earning some extra cash on the side for their family but even carving out new, big careers for themselves. Here is a list of over 20 of the best stay at home mom jobs that you can start today. Reasons to Work From Home as a Mom? How Much Can Stay at Home Moms Make? How do you Make Money as a Stay at Home Mom? If we’re all being honest, working from home sounds pretty appealing in general, whether you’re a mom or not. Not having to leave the house, not needing to put on makeup or change out of your pajamas? Sounds amazing to me! In all seriousness though, there are many reasons why working from home holds such an appeal for moms, and it’s not just because you get to have more time with the kids (although this obviously holds the most appeal). Need I say more? The average cost of daycare ranges from $4,000 to $26,000 annually. I don’t know about you, but I would much rather have that money in my pocket and also be at home with my kids. When you are picking a job to do as a stay at home mom, make sure you look at the hours that are required of you. There are a lot of online job roles now where the companies are aware of the fact that there will be a lot of stay at home parents applying for and then working for them, so they make it as flexible as they can. Something like teaching for VIPKID, for example, can fit in really well with when the kids are in bed! This is something that we don’t always think about when we are going out to a 9-5 job; the fact that we tend to spend money going to work. We have to buy clothes to wear to work (unless of course, you wear a uniform that is provided for you), and we have to spend money getting to work in the first place, in addition to all the smaller expenses that may come up – lunches, the occasional co-worker birthday or retirement gift to contribute to, etc. If you have a long commute, that is a lot of time that you are wasting just getting to work, and money that is spent on transport too. If you’re not doing meal prep and packing your own lunch every day (which many working parents don’t do! ), then you’re surely wasting money on convenience foods for your pantry! Imagine being able to contribute financially to your family’s future. Sound awesome? It sure is! Having a dual income household can set you up for financial freedom in more than one way. Making money from home as a stay at home mom will help you pay off your debt, save for retirement, and finally go on that family vacation you have been dreaming of. There isn’t a specific answer that will fit everyone, because every stay at home mom job is different, has a different level of experience needed, amount of time and other commitments, etc. But we like to show you the best paying jobs that can make you a decent amount of income for your family. You can easily make $15 per hour with most of the more beginner stay at home mom jobs. With the more advanced stay at home mom jobs, you could make upwards of $50 per hour! It depends on how much you want and how many hours you are able to work, and what exactly you are doing in your job. You definitely have the ability to get a part-time income and even a full-time income from working from home, so long as you have the drive and the hustle! Luckily there are plenty of stay at home jobs for moms that you can do. You’re just starting to look for ways that you can make money as a stay at home mom – but there is a ton of information out there and it can be hard to know where to start. The most common way to start is to offer your services to another business. This could be in the form of roles like freelance writing, proofreading, online tutoring, etc. Another way of making money is to start up your own business, with ideas such as blogging, selling on Amazon, life coaching, and more. 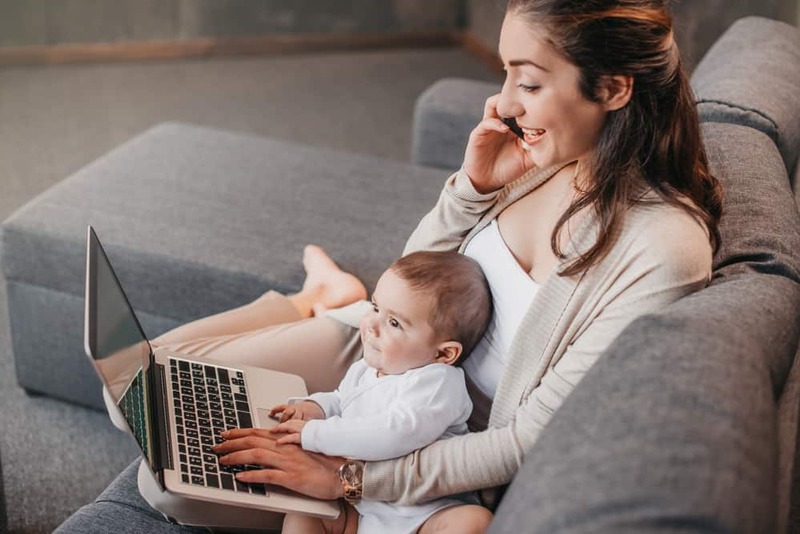 We will take a look at 20 high paying stay at home mom jobs that you can start earning money today with – including the best jobs for stay at home moms with no experience. What it pays: According to ClearVoice, the most common amount charged by beginner freelance writers is $21-$40 per hour. You can also either be paid per word or per article – it’s up to you to decide which works best for you. Perfect for: Moms who love to write, but are also able to work quickly and with high accuracy. If you’re looking typing jobs for stay at home moms, this is for you. What it is: Lots of companies and brands have the need for content to be produced for them, and they often hire this out. This could be in the form of blog posts, articles, writing emails, social media posts, etc. How to get started: You can look for freelance jobs on job sites such as Indeed, Problogger, WritersWork, etc. You can also find work by pitching to brands/sites that you are aware of and could possibly need writers (even if they are not advertising for them). A lot of freelance writers are having a lot of success nowadays finding work in Facebook groups, so this is something to look at too. Holly Johnson – a six-figure freelance writer, offers a free workshop Earn More Writing for budding freelance writers to get you started on the right track. What it pays: The average pay for online proofreading jobs per year is $50,943. Caitlin Pyle made $43,000 in her first year of proofreading while she was still working full-time and has now put together a free workshop for those who are considering starting proofreading. Perfect for: Those of you who have an eagle eye and can spot mistakes from a mile off. This is something that I personally do without even meaning to – when I am reading a menu or a book for example. What it is: You will read over and edit any errors that are in a piece of writing work. This will include spelling errors, as well as grammatical errors too. As a proofreader, you will be the last set of eyes on a project, ready to catch any errors before the final piece of work is submitted. How to get started: The way that you can find work can be very similar to freelance writing as mentioned above – look at job sites, within Facebook groups, and pitch for work to publications. Don’t forget to sign up to the free workshop over at Proofread Anywhere. What it pays: This varies from blogger to blogger, with some people making a small amount each month, and some making 5 figures per month or even more! It depends on a variety of factors, such as how much work you are able to put into it, how profitable the niche is that you are in, how much you spend on things to help you, having a solid content and marketing plan, and so on. A study by ProBlogger showed that the monthly earnings from their readers were 28% earning under $10 a month, 25% earning $10-$99 a month and 17% earning $100-$499 a month. There are of course more bloggers earning different amounts, but that is good for giving you a general overview. How do bloggers make money you ask? Affiliate marketing is where you promote services or products to your readers, and if they click through your link and complete the transaction, you will get a commission from the company for pointing them that way. There is a lot of potential for making thousands of dollars per month with affiliate marketing, providing you learn about the best affiliate marketing strategies, including the best affiliate programs to work with, and how to get your readers to click on the links. Our friend Michelle makes over $50,000 per month with affiliate marketing, and due to popular demand, put together a course to teach us her best tricks. Sign up here to get started today. Once you have got a decent amount of traffic coming to your site, you are able to sign up to good advertising networks which pay out a lot of money, such as Mediavine, who we are currently with. Sponsorships are when a brand will pay you to write about them in a dedicated post (or multiple posts) on your blog. These may also include social media shares or could be just on your social media. We get the majority of our income from some amazing brand partnerships and were certainly helped along the way by the course Making Sense of Sponsored Posts – again run by Michelle, and her sister Alexis. Selling products and services is a great way to make money from your blog, and you can get started with them at any point in your blogging journey. Have created it and put it up for sale, you don’t need to do anything else (apart from promoting it of course!). Examples of products and services could be eBooks, guides, courses, coaching, etc. Perfect for: All moms. We all have a story inside of us that we want to tell, and we all have special areas within our lives that we have people ask for advice on. If you love writing then that’s a good start, but it pays to be good on marketing your blog such as on social media and writing content that will get you high on Google’s list. What it is: A blog is a website that you run, and post content relating to your subject – for example, this is a personal finance blog where we share ways that you can manage, make and save money. How to get started: You can get started by reading through our how to start a blog guide – it has step by step instructions on what you have to do to get set up. Grab your free domain name and website hosting for as little as $2.95/month through our exclusive link with Bluehost. What it pays: The average pay for a Virtual Assistant is $15.64 per hour. This will obviously vary depending on the amount of experience you have, and how you price your services. Perfect for: Moms who love to organize, have systems and preferably have some administrative experience. What it is: This will be different depending on the companies that you work for and their requirements, but it is essentially doing administrative work remotely. Examples of work that you could be doing include: scheduling work, answering phone calls, making appointments, managing diaries, organizing files, etc. How to get started: To get started, you can look to apply for jobs on sites such as Indeed or FlexJobs. A good way to also look for jobs could be to approach local businesses and see if you can offer any help to them. What it pays: The average pay for a social media marketing manager is $15.42 per hour. Perfect for: Moms who love organizing, and are a whizz on social media. If you enjoy managing different systems and know your way around WordPress and sites like Pinterest or Instagram, you are going to get a good deal of work coming your way. What it is: When you become a blogger, you quickly realize that there are a lot of tasks that you don’t enjoy as much or simply don’t have as much time for. These tasks tend to be things like social media management – because although it is necessary, there are other things that have a higher return of investment, along with the fact that it can be really difficult to juggle a bunch of different social platforms all at once. With that in mind, a lot of bloggers and other business owners turn to social media-focused virtual assistants to help them with their workload. Ideas of things that a virtual assistant in this regard does could be: pinning on Pinterest, scheduling Facebook or Twitter posts, posting on Instagram, answering emails, etc. How to get started: There are a lot of blogging Facebook groups out there, where your ideal customers will be. If anyone asks advice you can give your advice and be known as someone who gives a lot of value. People also often ask if there are any virtual assistants as they want to hire one. If being a Pinterest VA appeals to you, there is a fab course that guides you through how to start up your own business doing this – sign up here. What it pays: The standard in this industry is to charge $1000-$2000 per client, and it only needs to take you a few hours each week, after the initial set up and testing. Perfect for: Those of you who are good on social media and/or marketing, or are eager and willing to learn. If you don’t have previous experience in this, it may be good for you to invest in a course or coaching that will help you learn how to do so. What it is: You’ll find that many local businesses don’t have a great marketing strategy in place – because they’ve been relying on things like foot traffic and word-of-mouth to market their business. Maybe they started a small company and it did better than they had planned and they want to get the word out to more people, or maybe they aren’t doing so well and they need a hand. Either way, all businesses need to make sales in order to make money and keep running, so a marketing plan is something that every business needs. They may not know where to get started with this, which is where you can come in. You can be in charge of their marketing, depending on what you think would work well for them. A good place to start can be Facebook marketing, as their ideal customers are bound to be on Facebook. If you aren’t too savvy with Facebook ads right now but would love to become a Facebook ad manager, you should click here to sign up for a course run by our friend Bobby Hoyt who teaches this. How to get started: The best thing to do is to try it out yourself first, so that you know how to do it before you start offering it as a service! Sign up to Bobby’s course the FB Side Hustle today. What it pays: The average hourly rate is $20 per hour or around $43,316 a year for a tutor. Perfect for: Former teachers, or those who hold a bachelor’s degree. What it is: You can help children or students to learn in an area in which you have more expertise. Examples could be teaching English, math, etc. When my husband, Kelan, left his job, he worked for a bit for VIPKID teaching English to children in other countries and loved it! How to get started: Sign up with VIPKid to get started with teaching English to students in other countries. There are lots of moms who do this early in the morning before their kids are awake, so it is perfect for family life. Start making $15-$22/hour teaching English online with VIPKID. Start your application now. What it pays: This is dependent on the company you are doing it for and how much they offer for each survey, but you can make some cash if you put the work in. Perfect for: Moms who don’t have a lot of time where they can sit down and hammer out a bunch of work for hours on end. If you are looking for something that you can do around your kids, then this is for you. How to get started: Sign up for the best survey sites around – Survey Junkie and Swagbucks. What it pays: You can earn up to $60 per test. You will be paid $10 via Paypal for every 20-minute video that you complete. Perfect for: Anyone with access to a phone (e.g. iPhone), a PC or Mac that has an internet connection and the ability to download their software. You must also be over 18 years old and be able to speak your thoughts out loud. What it is: You visit a website or app, and complete a set of tasks whilst speaking out loud about what you are doing and your thoughts on it. Companies will pay you to do this because they want to make sure that their customers are happy, and get feedback from their sites or apps. Hearing your thoughts as you look at it live, can give them valuable insights that could lead to more sales for them. How to get started: Sign up through UserTesting here. You will need to take a sample test, then when you are approved you can get started earning. What it pays: The average salary of a data entry clerk is $13.85 per hour – although this is typically for a non-remote worker. Perfect for: If you are a fast typer and don’t mind work that may be a bit repetitive at times. You will need to be computer literate and have a good understanding of computer systems. What it is: Data entry is the process of moving one form of data into another, usually done on a computer. This is typically quite a big job, so many companies hire out for this part of their business. How to get started: Have a look at sites such as FlexJobs or Indeed. There are other sites that you can use such as SmartCrowd, SmartLocating, Clickworker, and you could also try out Fiverr. What it pays: The average wage for a bookkeeper ranges from $18 – $23 per hour, with the average being around $20 per hour. Perfect for: Ideally you will be good with numbers, as this is what you will be dealing with! You will need to be highly organized and have a good eye for detail and spotting mistakes. What it is: Bookkeepers are generally responsible for a company’s financial accounts. You will produce financial statements, record all income and costs that the company is generating. How to get started: Take a look at sites such as Indeed or FlexJobs. You could also reach out to local companies and see if they are in need of anyone. What it pays: You can make a lot of money doing this, but it will be dependent on what you are selling, your eye for what to buy, and how much time you put into it. There are plenty of people out there who are making more than a full-time income from selling on Amazon. Perfect for: If you enjoy finding a bargain, this is for you. Not everything will sell well on Amazon, so you have to do your research and hunt out the bargains that are worth flipping for profit. You will need to be organized, meticulous and willing to learn. What it is: You can sell pretty much anything on Amazon these days, and the best way to make a good profit is to get something for a low fee and then sell it on for a lot more. You can find items such as toys in a reduced price section at a local store and list them on Amazon. If you do Amazon FBA, you send the items to Amazon’s warehouse and they will ship them out to the customer for you once they have sold. How to get started: Have a read through some Amazon FBA articles or Youtube videos to get some advice from the pros on how they do it. The best thing to do is to just get started! You can use the Amazon FBA app to scan barcodes of items in your home to give you a feel for how it works, and go from there. What it pays: We have started our own Shopify store recently and have been making over $1000 a month from it. Our mentor Sarah Titus makes an amazing amount on Shopify – she made $52,060 in her first month on Shopify! You can get the training you need by taking one of Sarah’s incredible Shopify courses. Perfect for: Those who are handy at making things that you can sell online. What it is: Shopify is an online storefront where you can sell physical products, drop ship products, digital products or services. How to get started: Brainstorm ideas for what you want to sell exactly – it helps to have a theme. Then, set up your Shopify store with your products and get selling! What it pays: The average wage for a transcriber is currently $15.13 per hour. Perfect for: Quick typers, as you will need to type quickly and accurately for this role. What it is: You will be transcribing audio files – listening to the audio and then typing up what is being said on them – hence why the quick typing skills are needed! How to get started: There are a bunch of different websites that you can sign up to, and a lot of them will take on people who have had no prior experience. They are generally quite flexible as they realize that a lot of people doing these jobs will be working around their kids. Some sites to sign up to are: TranscribeMe, Capital Typing, CastingWords, GMR Transcription, etc. You will usually have to do a typing test before you are hired. What it pays: As with Amazon, it depends on how much time and effort you put into it, and your eye for spotting something good. Our friends over at Flea Market Flipper made $133,000 in one year from only working 20-30 hours per week! Perfect for: Those who are interested in having a comb through items to see if they would make a good profit. You will need to be organized and meticulous to keep on top of all of your stock and selling. What it is: This is similar to Amazon FBA, but you can resell on any platform that you want. You will find items that are for sale at a low price, and then sell on for a much higher price to get a great profit. You could resell on sites like Amazon, eBay or Facebook Marketplace, etc. How to get started: Sign up to our friend’s course over at Flea Market Flipper. They do this as a full-time job and their course will show you the items that sell well, as well as help you with shipping queries, etc. What it pays: This is a job with huge potential for a lot of income, but you need to go about it the right way. It depends on the type of client that you are going after, and if you are offering 1-on-1 coaching or group coaching. A general idea would be around $47 per hour if you are targeting lower-income clients or $297 per hour for higher income clients. Perfect for: Do you love helping people live their best lives? Are you good at personal development, and encouraging people to push themselves forward? If you have a positive and can-do attitude, this could be the job for you. What it is: There are many different types of life coaches out there, but typically a life coach is someone who helps their clients work towards their future goals and assists them along the way. How to get started: As with all coaching jobs, you’re probably going to want to get some certification before you start offering services to clients. There are some very expensive programs out there, but a good, lower-cost course to check out is Life Coaching Certificate Course – although make sure that you do your research first to ensure you choose a course or program that suits YOUR career needs. Check out other life coaches and see if it sounds like it appeals to you, and what makes them stand out. What it pays: The average pay for a health coach is $20.23 per hour, with the top 10% of health coaches earning $100,000 and above. Perfect for: Those who are interested and experienced in health and wellness. If you can motivate people and encourage them to improve in this area, this is the job for you. What it is: Health coaching is turning into a massive industry, because so many people want to get fit and healthy, but aren’t sure where to start. In fact, getting healthier is very much psychological, so this is where health coaches can come in to help. You can advise your clients on what steps to take and provide encouragement along the way. How to get started: You don’t currently need a diploma or certification to be a health coach. If you do however want to get a qualification, one of the more popular is the certification from the International Association for Health Coaches. What it pays: The average salary ranges from $29,000 – $58,000 per year, but it all depends on how much experience you have, how many clients, etc. Perfect for: Moms who love to travel, or have a lot of experience with traveling. Being able to build a good rapport with customers is a must. What it is: Travel agents are people who arrange vacations and travel for their customers, to try and find them the best deal and advise on the best destinations. You can set up as a travel agent company working from home, and do it all digitally and/or over the phone. How to get started: There are some agencies that will help you to get set up as a travel agent, such as: Travel Planners International, Nexion, Avoya Travel, and Outside Agents. What it pays: This depends on where you live, but you should be able to charge about $30 per day – but look at what other childcare companies in your area are charging and adjust accordingly. Perfect for: If you love kids and are happy to look after other kids as well as your own, at the same time. You will need to be responsible, organized, positive and a lot of fun. What it is: In-home childcare is where you are looking after other people’s children during the day, at your home. You will be required to set up play, feed them, generally look after them, and keep them safe. How to get started: You will need to get the correct insurance for looking after children in your home and make sure that you don’t need any particular licenses. You could also look at Care.com for opportunities in your area. What it pays: This depends on how many photos you are uploading, and which sites that they are on. Not only that, but you will likely be paid depending on how many people are downloading. For example, new Shutterstock contributors earn $1.88 for every On Demand Image download, but once they make $500, that rate goes up to $2.48. Perfect for: If you love taking photos, even if they are on your phone. To make decent money from this, you will have to take a lot of photos. What it is: There are sites out there that will pay you to upload your photography, if their customers are downloading it. How to get started: You can sign up to sites like Shutterstock or iStock Photo. Take a look at what other photographers are uploading, and get started! The list above is amazing if you are looking to start a new career at home, but there are some moms who aren’t looking for a career or significant income and just want to earn a bit of extra cash. Here are some great ways for you to do just that! A side hustle is a source of side income that you are bringing in around your usual schedule or work. More and more moms are turning to side hustles as a way of earning extra money that you can do around the kids, and have something for yourself as well. These are all great ideas of a side business for stay at home moms, and hopefully have shown you how to make money as a stay at home mom. As you can see from our list, there are not only stay at home mom job ideas for considerable income/careers, but also stay at home mom jobs with no degree! Our favorite last little tip for making some extra cash with almost no effort is to use all the cash back apps that we can! When you do your shopping, there are companies out there who can offer you money back on your purchases – yes, the ones you were making anyway! You will need to sign up to the apps, and then follow the instructions on them to see how to get your cash back. Do you do any of these stay at home mom jobs? Which appeal the most to you? Join us over in The Savvy Couple Community on Facebook to connect with others looking for ways to make and manage their money!